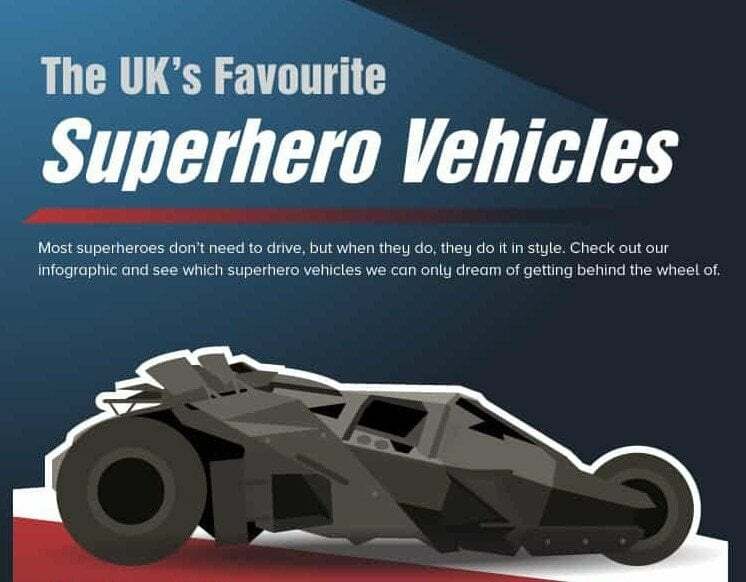 Which Superhero Vehicle Would You Love To Drive To Work? Many of us dream of having some form of superpower. Whether that’s jumping tall buildings or being able to breathe underwater, most people have their favourite. If you find yourself stuck in rush hour traffic, however, you might think seriously about borrowing your favourite world saver’s car or bike. The team at OSV have now produced a revealing infographic from a poll of UK residents who want to make the most of their commute to and from work. The big question they had to answer was which superhero vehicle they would opt for. Fans of Judd Dredge will recognise this beast of a motorcycle with its own robot brain. We don’t quite know where you might use the twin machine guns but you certainly may need the turbo boost function to get you through those traffic jams. If you’re after a bike that has size and power on its side, this is the perfect choice. Ridden by Johnny Blaze in the Ghost Rider series, the one thing that 7% of respondents really wanted was a bike that produced a fiery trail. If you’re heading off for your summer vacation, it’s the ideal high speed motorcycle for the open road. And if you want to get straight to the office, it has the neat ability to drive up walls. Another bike comes in at number four on the list, this time Captain America’s modified wartime Harley complete with rocket launchers on the side. If you are looking for a unique vintage style combined with hi-tech gadgets, this is certainly the only vehicle for commuting into the office during a weekday. Getting up and above the traffic and travelling at supersonic speeds seems to be on the mind of almost 10% of the respondents to the OSV survey. Across the Marvel series, however, there were around 2,000 different kinds of flying car used by Agents of SHIELD, including a 1962 red Corvette called Lola. In at the number 2 spot is the Green Hornet’s Black Beauty. Driven by side-kick Kato, this could be the perfect business car if you want to kick back and do some work while your chauffeur does all the driving. The flamethrower mounted in the radiator grill could also come in useful if you encounter business competitors on the road. It will come as no surprise that the Batmobile makes it to number 1 on the list, and by a considerable margin. Over half of the survey respondents voted for it as their favourite superhero vehicle. The question is which model would you choose? The original from the 1960s series is still a favourite but many prefer the Christopher Nolan Dark Knight remake, called the Tumbler, which was a cross between a tank and a Lamborghini. If you wanted a working model, however, you would have to delve deep into your business expenses and come up with at least $18 million.